After four years of wrangling, the outcome was that A/S Norske Shell had to pay a total of NOK 311 million on behalf of the field’s licensees. [REMOVE]Fotnote: NTB, 12 January 1996, “Shell tapte voldgiftssak om Draugen-dekket”. NOK 2.1 billion had already been paid following delivery of the structure from the Kværner yard in February 1993, but the two sides could not agree on the final amount. They had continued to negotiate on a number of issues related to this settlement, and managed to resolve most of the matters in contention. However, stalemate was reached in the autumn of 1994. Claims and counterclaims were presented, and one of the biggest arbitration hearings in Norwegian legal history began that August. Kværner had originally claimed NOK 200 million in compensation for forcing the pace of fabrication work – a demand later reduced to NOK 165 million. For its part, Shell maintained that the yard had breached the contract either deliberately or through gross negligence, and presented a compensation claim of NOK 1.47 billion. This was later restricted to NOK 576 million on condition that the Draugen licensees were allowed to retain a bank guarantee of NOK 198 million. [REMOVE]Fotnote: Dagens Næringsliv, 13 January 1996, “Shell tapte mot Kværner”. The final adjudication rejected Shell’s claim, thereby handing Kværner a complete victory. Shell had to pay NOK 113 million for the bank guarantee and as a supplement for extra work. In addition came interest and legal fees. According to communications vice president Atle Kigen at Kværner, this settlement was worth NOK 225 million to the group in 1995-96. [REMOVE]Fotnote: Aftenposten, 13 January 1996, “Draugenseier til Kværner”. The operator decided to drop the detailed design requirements which had been usual since the early 1980s, and opted instead for the recommendations made by Norway’s Norsok project. Intended to enhance the competitiveness of the Norwegian continental shelf, the latter had come out in favour of performance-based specifications for offshore facilities. Setting clear demands for user functionality, safety and the working environment, without going into details, would offer cheaper, more efficient and safer solutions. 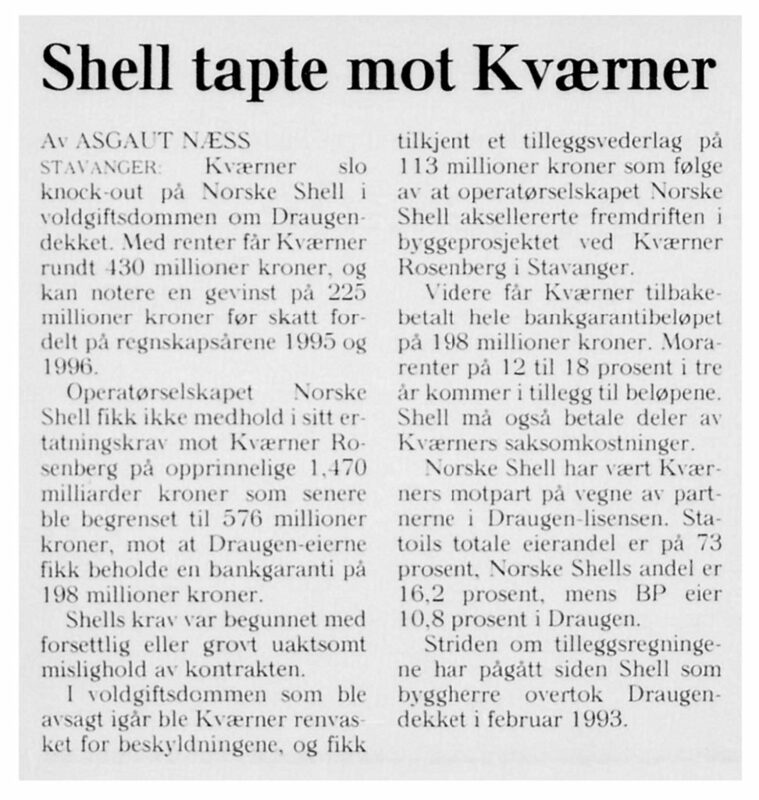 [REMOVE]Fotnote: Nytt fra A/S Norske Shell, summer 1992, “Nytt borekonsept for internasjonalt marked”. Norske Shell required that analyses were conducted with the work operations and crew most vulnerable to accidents, and how such incidents could be avoided. [REMOVE]Fotnote: Nytt fra A/S Norske Shell, summer 1992, “Sikkerhet og arbeidsmiljø i sentrum”. The attention devoted to safety and performance-based requirements gave the newly formed Hitec-Dreco joint venture the opportunity to turn its innovative ideas into reality. These in turn would create a new generation of drilling rigs for fixed offshore installations worldwide. One member of this partnership, established in 1989, was Hitec, a Stavanger-based specialist in instrumentation, electrical engineering and computer systems. The other was Canada’s Dreco, which delivered all types of drilling equipment to the global market. This company also had experience of tough climatic conditions from delivering modularised rigs for Arctic exploration. 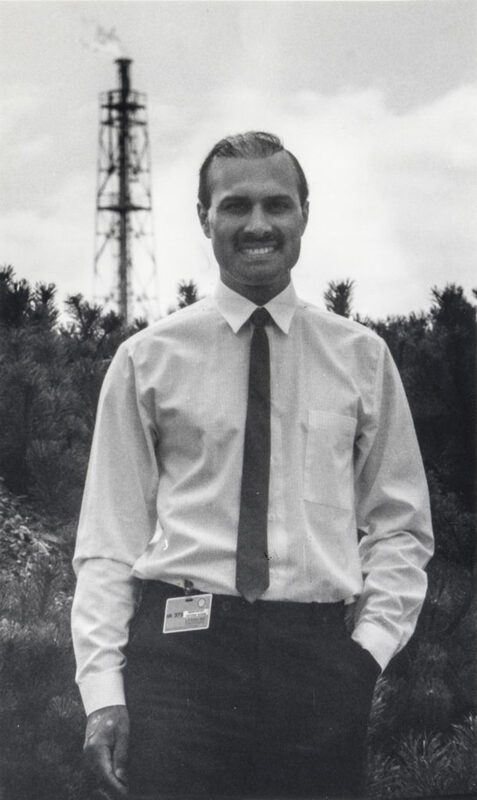 John McGill was in many respects the pivotal figure in this new constellation, and served as Hitec-Dreco’s chief executive during the first few years. After leaving a Norwegian drilling company in 1987, he had many ideas about how equipment could be improved in terms of safety and the working environment. And these proposals would not least involve big reductions in both weight and price. A plethora of new ideas was put forward when the joint venture got started. Not all of these were equally good – most were actually rejected. But a good climate of cooperation between the two teams yielded very interesting concepts. When the invitation to tender for Draugen arrived, a creative forum could come up with viable options. The drilling module was not to have a long life on the platform. It was removed in 1997 and subsequently had an interesting career. Read more about where the rig ended up. Draugen lies in block 6407/9. Included in the eighth licensing round in the autumn of 1983, it was awarded the following March to Shell as operator and partners Statoil and BP. The field was discovered by the very first wildcat. This initial exploration well was plugged and abandoned six months after the award of the production licence. Running in a north/north-westerly direction, Draugen is about 21 kilometres long and six wide. Its reservoir lies about 1 600 metres beneath the surface and is typically 40-50 metres thick. Oil is found in the Rogn and Garn formations, which date from the Late and Middle Jurassic. [REMOVE]Fotnote: A/S Norske Shell (September 1987) Plan for development and operation (PDO). Six wells were drilled to determine field size and extent before the plan for development and operation (PDO) was submitted. At an early stage in maturing Draugen, ahead of the PDO, stock tank oil initially in place (Stoiip) was put at 1.1 billion barrels with an estimated recovery factor of 30-40 per cent. [REMOVE]Fotnote: Note dated 14 July 1986 from J van der Burgh, Shell EP. Before an oil field can be brought on stream, it has a long history. First of all, the geologists must determine that three basic requirements are present. Deposition of permeable and porous sandstone where oil can accumulate – reservoir rock. Sediments where oil can form initially – source rock. An impermeable layer lying over the reservoir which prevents the oil from leaking out – cap rock. On Draugen, the Rogn formation provides the main sandstone reservoir while the cap and source rocks are the same – the Spekk claystone formation. The Rogn interval was laid down on top of Spekk clay around 150 million years ago, during the Late Jurassic period. Europe and America/Greenland were still close to each other then, and the water depth ranged from a few metres to 20 metres – very different from today’s 250 metres. At that time, dinosaurs and other reptiles were the only big animals in the area which was to become Draugen. No fossils of these creatures have been found, but some cores have shown signs of trees. The oil lies in the pores between sand grains ranging in size from crystals of table salt to small peas. Most are similar to the eggs in cod roe (rogn in Norwegian – hence the formation’s name). Stratigraphy over the Haltenbanken area. As the sea level rose, further Spekk clays were deposited over the sand and eventually formed a carpet impenetrable to liquids and with a high content of organic materials. These derived from the remains of microscopic plankton (algae), which render the Spekk shale dark. The clay is even a little radioactive. Under the right conditions, the organic deposits also give rise to oil. Before this crude can escape from the shale, it has to be warmed up a good deal. Burial of the Spekk formation under 2-3 000 metres of rock or more meant that the temperature generated from the Earth’s natural heat became high enough to cook out the oil. However, the area where Draugen lies today has never been buried more than about 1 600 metres beneath the seabed. That was never deep enough for crude to form. But the rocks lay much deeper to the west of the field, and this is presumably where the Draugen crude comes from. It has migrated under the Spekk cap rock to the points nearest to the surface. This process is driven by the force of gravity – oil floats on water, and rises until it meets an impermeable barrier. [REMOVE]Fotnote: Knipsheer, Jan Hein (1994). 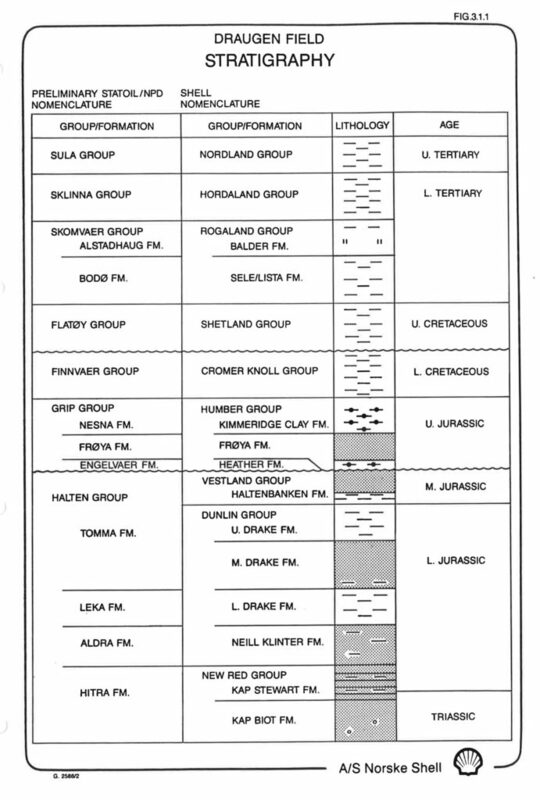 Geologien på Draugenfeltet, EPOinfo no 3: 11. The neighbouring Njord and Heidrun fields derive from the same source. The Draugen platform has produced oil and gas with an overall value of roughly NOK 250 billion over the 25 years since it came on stream. The field was discovered in 1984 in a highly permeable structure which has since proved to be an extremely productive reservoir. It soon became a candidate for development at a time when new discoveries had to queue up to secure official authorisation. The Norwegian government had only opened the Norwegian Sea to oil and gas operations relatively recently, and a number of partnerships were drilling wildcats in the area. Many groups had been against extending exploration to new areas of the Norwegian continental shelf (NCS), and thereby crossing the barrier represented earlier by the 62nd parallel. 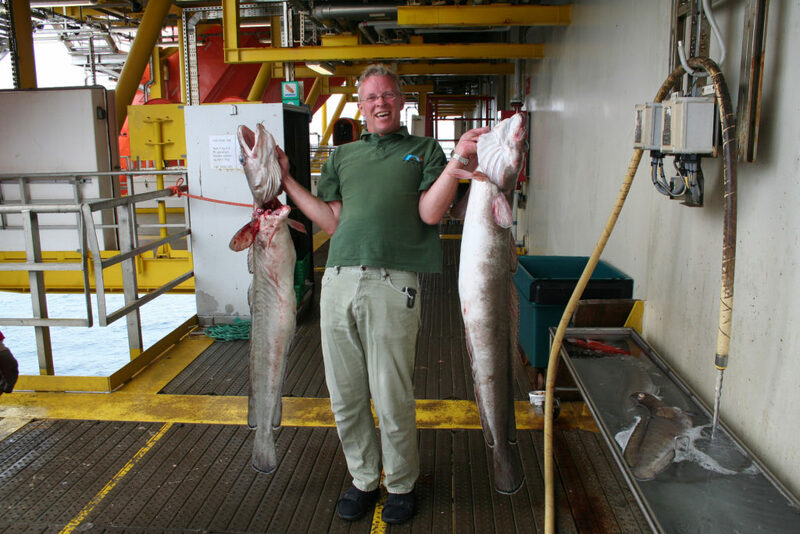 This opposition reflected fears – which have since proved groundless – that the rich fisheries in the Halten Bank area could be harmed. In fact, the fishing and petroleum industries have demonstrated that they are able coexist harmoniously in the Norwegian Sea. When Draugen began producing oil on 19 October 1993, it was expected to yield almost entirely oil – some 430 million barrels or 68 million standard cubic metres of oil equivalent (scm oe). 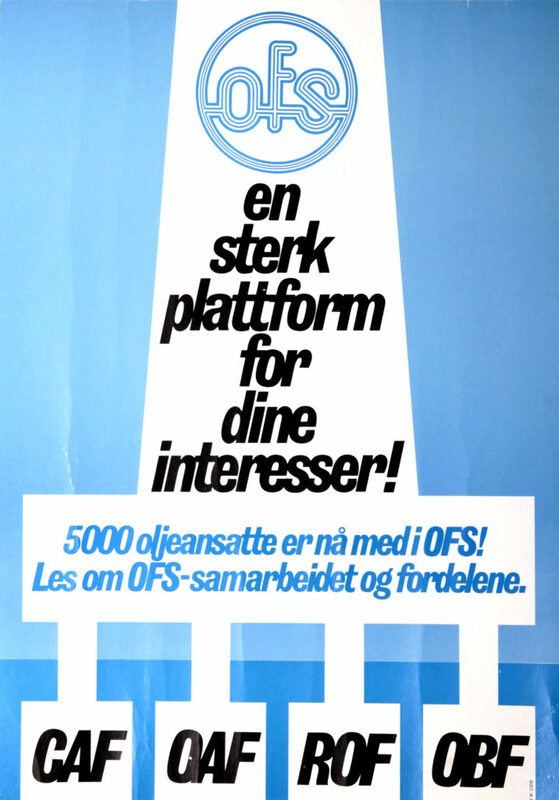 [REMOVE]Fotnote: Norwegian Petroleum Directorate, Facts, 1983. Since then, the recoverable amount has been increased to about 140 million scm oe. [REMOVE]Fotnote: Norwegian Petroleum Directorate website, fact pages fields, 1 October 2018. 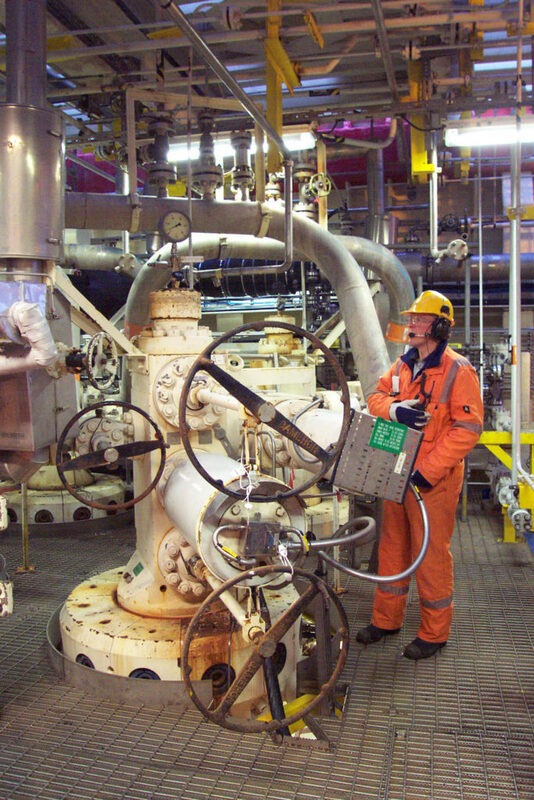 Operator A/S Norske Shell has also made changes to its production facilities over these years. The upshot of these alterations is that daily output has been significantly increased since the field first came on stream. Read more about capacity increases and updating. Figure 2. 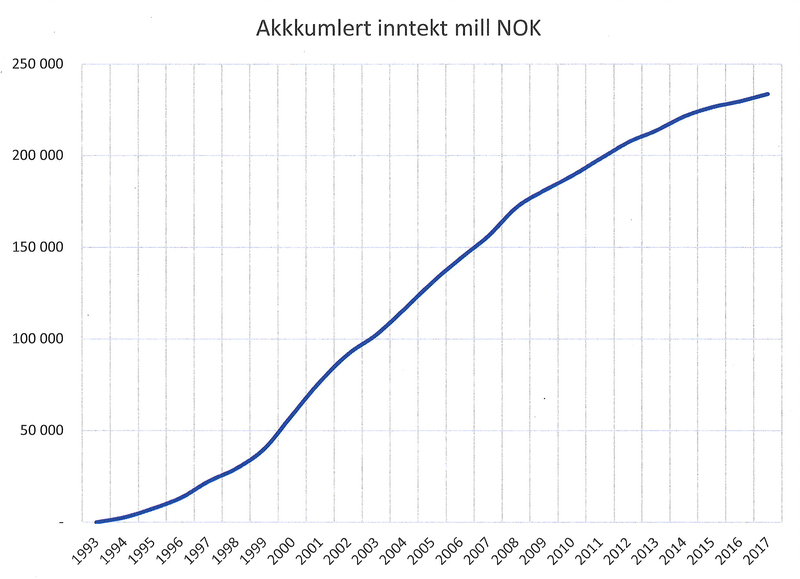 Draugen has produced assets worth almost NOK 250 billion in all since 1993. These revenues are calculated on the basis of a production profile obtained from the Norwegian Petroleum Directorate’s fact pages in the autumn of 2018 and an annual average oil price taken daily from Norwegian business newspaper Dagens Næringsliv. Petoro is a partner in the Draugen licence, with a 47.88 per cent stake at April 2018. This state-owned company manages the government’s own oil-related holdings. 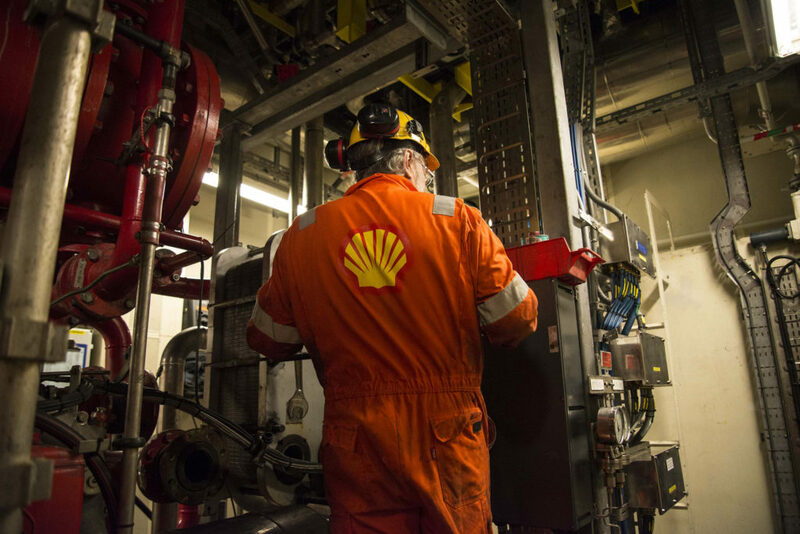 Norske Shell became the first oil company to locate an operations organisation to mid-Norway and Kristiansund – a choice supported by the government providing the local region benefitted. The Draugen platform stands by itself out in the Norwegian Sea, with no other fixed facilities close by. Those who work there have been concentrated together in a confined space. Many of the field’s personnel have worked there for many years, making them thoroughly familiar with the installation and allowing close ties to be developed between colleagues. When Draugen came on stream in 1993, 43 people per shift were expected to be sufficient for normal operation. Their jobs covered managing the process, maintenance, catering and cleaning, medical care and safety. Most of these personnel are employed by Norske Shell or the catering company. The workforce can expand considerably when major maintenance or conversion work is underway. Draugen employees work offshore for two weeks, followed by four weeks off on land. They do 12-hour shifts, either day or night, and their working hours over a year compare with those of an industrial worker on land. 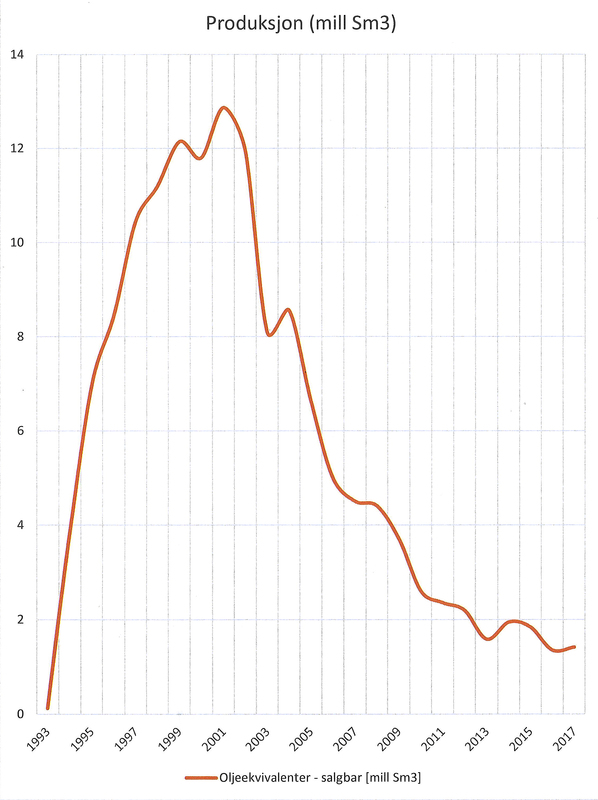 Generally speaking, a shift runs from 07.00 to 19.00, and from 19.00 to 07.00. Work is planned so that as much as possible is done by the day shifts. Three shifts, each working two weeks at a time, are needed to get the tour rotation to work. Since a new team takes over responsibility and jobs every other week, logging and documentation of work done, irregularities and plans are crucial. When a different person comes out to work, they need to know what has happened over the four weeks since their last tour. So time was devoted to recording and reporting. During the early years on stream, this could take the form of logbooks kept on the platform. Logs have subsequently become computerised, making them also available to the land organisation. As communication via radio links and data transfer has improved, computerisation has provided enhanced support in ensuring the continuity of work at shift changes. The team on land has access to the same computer systems used offshore, and follow up activities on the platform through such technologies as videoconferencing. During their offshore tours, employees are part of a community which lives and works in one place. Draugen is a 24-hour society, in that workers also spend their leisure hours there. The latter are largely devoted to eating meals and getting enough sleep. But some time is available for talking with colleagues and reading the papers. A number of leisure activities are also provided on the installation, with a welfare committee made up of enthusiasts elected by the workforce. This organises film shows, golf in a simulator, computer games, song and music, arts and crafts and angling. [REMOVE]Fotnote: A/S Norske Shell (2005) Shell Drift Draugen, brochure. The gym is the most popular leisure provision on Draugen. 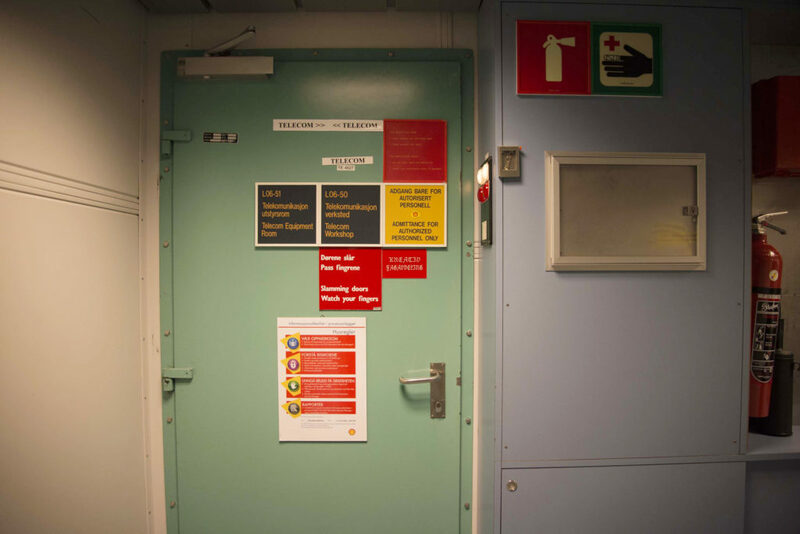 At one time, mobile phones were prohibited on all Norway’s offshore facilities because they could interfere with helicopters, or exploding batteries could serve as an ignition source. Control of the information flow provided another important reason for the restriction. The company was concerned about what information – or disinformation – could be sent ashore and create uncertainty and needless fears. Mobile phones are still banned from the production area, precisely because of concern about possible battery explosions and disruption of electronic instrumentation. [REMOVE]Fotnote: Teknisk Ukeblad 7 November 2013, Derfor må mobilene bo på hotell,. https://www.tu.no/artikler/derfor-ma-mobilene-bo-pa-hotell/233850. 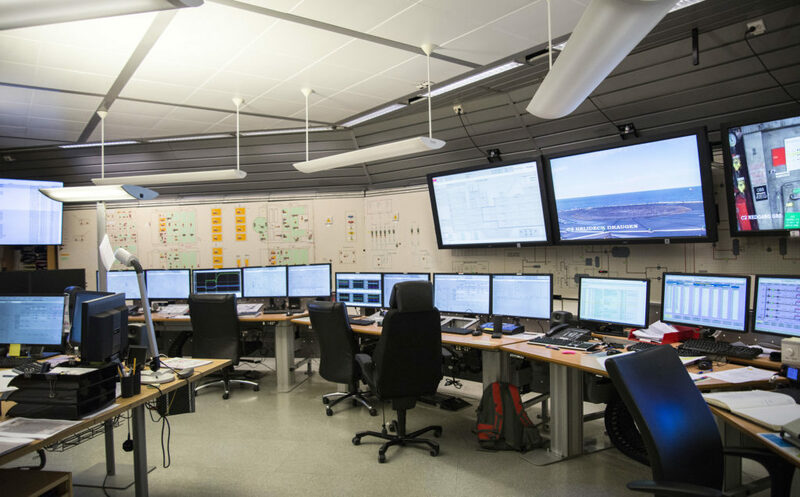 The central control room (CCR) is the platform’s heart and nervous system, and can monitor, govern and regulate the whole production process with the aid of a comprehensive computer system. It runs the process and safety systems, which involves continuous supervision of operational equipment – including fire and gas detection as well as safety systems such as fire pumps and emergency power. A minimum of two operators must be in the CCR at all times to facilitate planned work on the production facilities as well as responding to messages and alarms. These personnel are also responsible for monitoring and controlling the loading of oil into shuttle tankers. The CCR has a number of work stations, allowing operators to monitor and work on several systems simultaneously. More than two of them can be on duty when things get hectic. Handover procedures between day and night shifts are just as important as they are when tours are being rotated offshore and to land. When the night shift is due to take over, meetings are held with the day shift before it stands down. Held in a room adjacent of the CCR, these review jobs done and planned, and the work permits (WPs). The WP represents an important document on offshore facilities. They are designed to ensure that all risk-related aspects have been taken into account. That covers the planning, approval, preparations, execution and completion phases. All activities are thereby coordinated, with information given on hot work or closed areas/equipment and taken into account when doing other types of jobs. All WPs must be approved by the operations supervisor or the offshore installation manager (OIM). Most of the process on the platform is automated – not least shutdowns. If abnormal values are measured by the detectors, the whole process plant will automatically cease running. If such an emergency shutdown (ESD) or other crisis occurs, the CCR operators are trained to handle them. That plays an important role in safety and risk management work on Draugen. A number of closed-circuit TV (CCTV) cameras are installed on the platform, allowing the CCR operators to follow physical events out in the process. Since the platform came on stream, the CCR has been converted and upgraded a number of times. Bigger computer monitors and newer control software have been installed. These upgrades have been carried out in consultation with the CCR operators in order to ensure that they provide the best possible workflow. [REMOVE]Fotnote: Raaen, Stine N (2015), Team Situation Awareness in Practice, MSc theses in cybernetics and robotics, Norwegian University of Science and Technology (NTNU): 60. The meeting room is linked to the CCR, and contains systems for videoconferencing and collaboration with the land organisation. It also serves as an emergency response centre. Screen capture from the film 1-2-3 Vi er med! produced for a campaign launched by the Draugen operations organisation in 1994. The operations team on land is structured to support work on the platform, and performs the administrative duties which do not need to be done offshore. It includes experts on the various activities pursued on the field, and additional capabilities can be acquired as and when required. The specialists on land can decide on the action to be taken in meetings with the offshore organisation. One factor which attracted particular attention in the first phase after the field came on stream was the challenges faced in getting sea and shore to collaborate. These problems could be related to the slow performance of computer systems and lines of communication, and inappropriate reporting structures. One approach to improving collaboration and understanding between the two sides has been to post offshore personnel to the operations office on land for periods. [REMOVE]Fotnote: Conversation between production technician and acting chief safety delegate Jan Atle Johansen and Gunleiv Hadland from the petroleum museum on the Draugen platform, 7 March 2017.This means staff in Kristiansund have practical experience of working conditions on the platform, allowing them to conduct planning and administration related to work offshore. 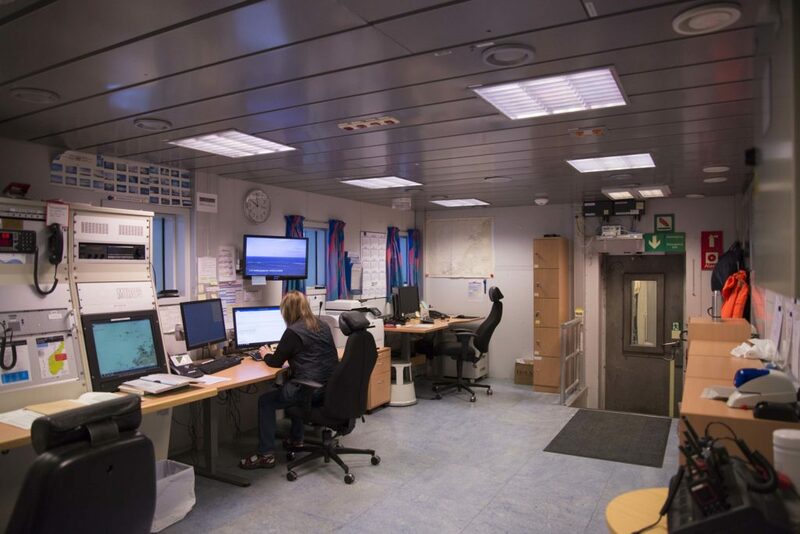 Since the operations centre on land was opened in 2007, provision has been made for monitoring Draugen production from there – particularly on the night shift. Should unusual incidents occur on the platform during these hours, key personnel from the day shift are called out until the position has been clarified. [REMOVE]Fotnote: A/S Norske Shell, 10 April 2003, Draugen organisasjonsendring. Konsekvensvurdering – Produksjonsleder Natt. The land organisation has departments for logistics, contracts and procurement, human resources, maintenance, production support, and filing and document management. [REMOVE]Fotnote: A/S Norske Shell (2005) “Driftsavdelingen i Kristiansund”, Shell Drift Draugen brochure. One example of a function which has been transferred from field to land is the switchboard for handling external telephone calls to the platform. 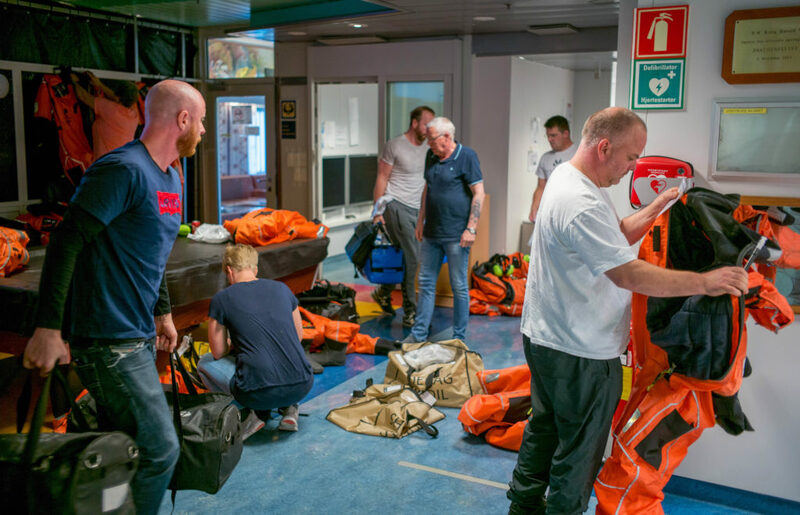 The work of planning personnel resources in connection with sickness, leave of absence and extra activities has also been moved ashore. Sea-shore collaboration has been boosted by the process simulator at the Kristiansund office, which was included in the development plans as early as 1987 for personnel training. [REMOVE]Fotnote: Draugen impact assessment, September 1987: 22. This facility was constructed with control systems which mimicked those in Draugen’s CCR, and it could be used before the field came on stream to test management of the process. [REMOVE]Fotnote: Draugen magasinet, no 2 1993, “Simulatoren brukt som testverktøy”, A/S Norske Shell E&P operations department. Everyone employed as a production operator was trained in the simulator, and had to demonstrate at the end of the course that they could shut down and restart the wells. A training plan was tailored for each person. Using the simulator, they could make mistakes and practise until they were proficient. Operators could only start working on the platform after their competence had been approved by the instructors attached to the simulator. Day courses have also been organised so that operators on their way out to the platform can be informed about updates since they were last at work. When changes were made out on Draugen, the simulator was updated accordingly and, if necessary, the alterations could be tested before being introduced offshore. [REMOVE]Fotnote: Interviews between Nils Gunnar Gundersen and Gunleiv Hadland from the Norwegian Petroleum Museum, 27 October 2016 and 1 November 2017. Training in this facility has played an important role in educating the production operators, and has been extended through their work out on the platform. As much maintenance work as possible on a platform like Draugen is preventive, and planned to avoid the need to take corrective action – in other words, repair a fault after it has occurred. Maintenance based on fixed intervals includes such activities as replacing seals, filters and other components exposed to wear and tear. [REMOVE]Fotnote: Pedersen, Vikse and Tingvold (2017): Vedlikeholdsanalyse RCM hos Shell, BSc thesis, Molde University College: 9. This is the same approach as the one taken with a car which gets serviced at regular points, where parts are replaced after a specified number of kilometres driven or time passed. Roughly 150 different safety valves are in use on Draugen, for example, tailored to various sizes and pressures. These get replaced during production shutdowns or maintenance campaigns. [REMOVE]Fotnote: Pettersen, Victoria C F and Sæter, Karina L, 1 July 2014, RFID-merking av sikkerhetsventiler: Forbedring av informasjonsflyt i vedlikeholdsprosesser på Nyhamna, BSc thesis in petroleum logistics, Molde University College. Maintenance work on Draugen is organised on the basis of an inspection programme which specifies equipment checks at certain intervals and is coordinated by computer systems. The programme lists components where critical faults could arise and which must receive particular attention during maintenance. Other items can be assessed as safe to leave until they fail, and are only replaced then. An initial version of the inspection programme was established in the spring of 1993, even before the field came on stream, in a collaboration between Møre Engineering, Liaaen and CorrOcean. [REMOVE]Fotnote: Tidens Krav 12 May 1993. 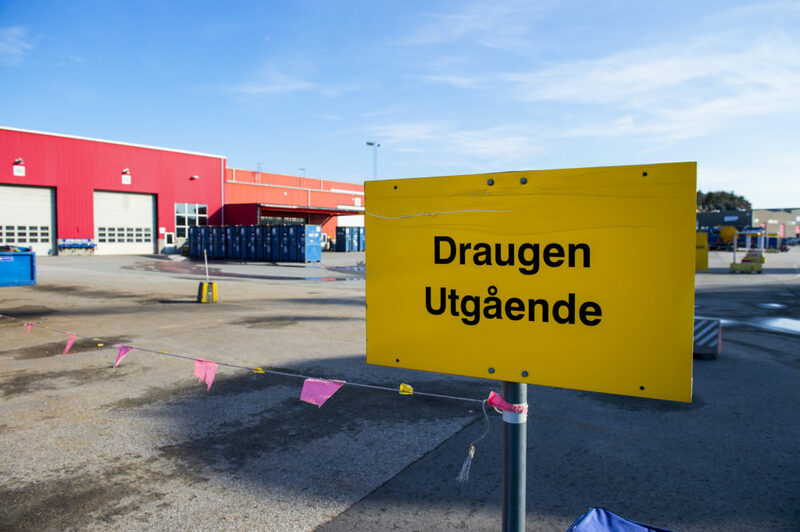 “Møre Engineering: Fra bygging til drift”. Supplement on industry in Nordmøre. Much of the equipment is continuously supervised by a computerised condition monitoring system (CMS). Analysing data from the process plant can detect whether something is wrong. Also set up to notify abnormal temperatures, this condition-based maintenance (CBM) solution avoids having to open up the equipment to check for faults. Once the CMS has provided such notification, the load on the relevant component can be reduced until it can conveniently be replaced. The operator on the platform reports to the technical supervisor, who contacts the responsible manager on land in turn. [REMOVE]Fotnote: A/S Norske Shell (2005) Shell Drift Draugen, brochure. They can then jointly assess the action to be taken. Planning maintenance tasks has made it possible to concentrate such work at times when production from Draugen is shut down. These periods are known as “turnarounds”. Production from the platform has been suspended for roughly 14 days every other year – or once a year in the event of major projects. A dedicated team in the operations organisation on land will have been responsible for planning the work to be carried out during a turnaround. Equipment, extra personnel and required materials need to be ordered well in advance in order to be available at the right time. [REMOVE]Fotnote: Shell Drift Info Draugen and Ormen Lange no 5, 2006, “Vedlikeholdsstans krever ett års forberedelse”: 9. A turnaround is usually scheduled for the summer season so that weather conditions are as good as possible during this period of concentrated work. The scope of maintenance grows as a platform ages, and doing it takes longer. Wear and tear can lead to failures and faults, and cause accidents or unwanted shutdowns if not detected in time. With the need to replace all or part of equipment items increasing over time, the attention devoted to continuous improvement and maintenance efficiency also rises. Contracts have been awarded to Aker Solutions and Aibel for work on maintenance and modifications, and these companies provide additional personnel to help carry out such work. The platform’s catering personnel are responsible for such activities as food preparation and cleaning, and are employed by external contractors. Nevertheless, they have been incorporated in the permanent offshore organisation, shown on organograms and included in presentations of the workforce. In collaboration with the platform nurse, catering staff also have roles in first aid, emergency response and drills for this. [REMOVE]Fotnote: Conversation with nurse Carina Løvgren on the Draugen platform, 7 March 2017. A small organisation means people have supplementary duties, particularly if a crisis occurs. Once a year, personnel practise establishing an emergency sick bay in the mess. Installed in cooperation with the nurse, this facility is dimensioned for up to seven injured people. The operations organisation has been split between platform and land, but a trend in working life on Draugen is the transfer of jobs to the onshore team. This has meant a gradual reduction in permanent staffing offshore. 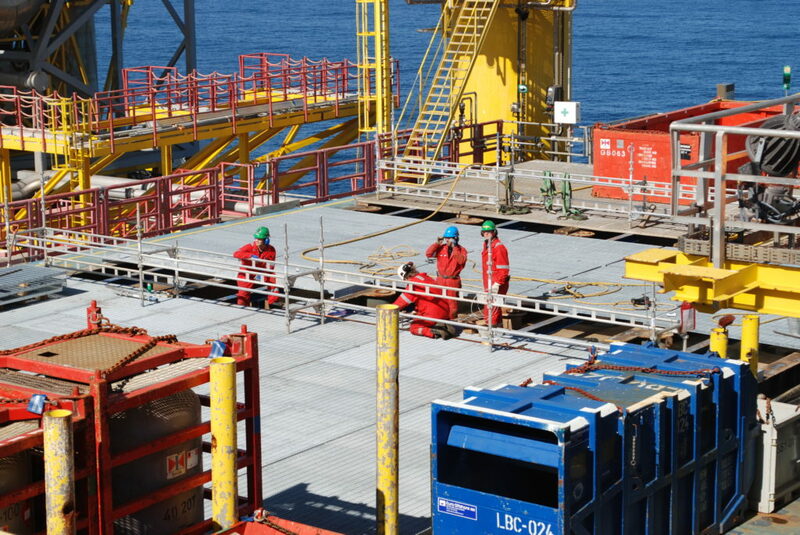 Heavy-duty maintenance and major projects are assigned to limited periods during the summer, when extra personnel and specialists on the relevant work are sent offshore. The Norwegian Storting (parliament) decided as early as 1988 that Draugen’s operations organisation would be located in Kristiansund. But it takes time to build up a completely new team. 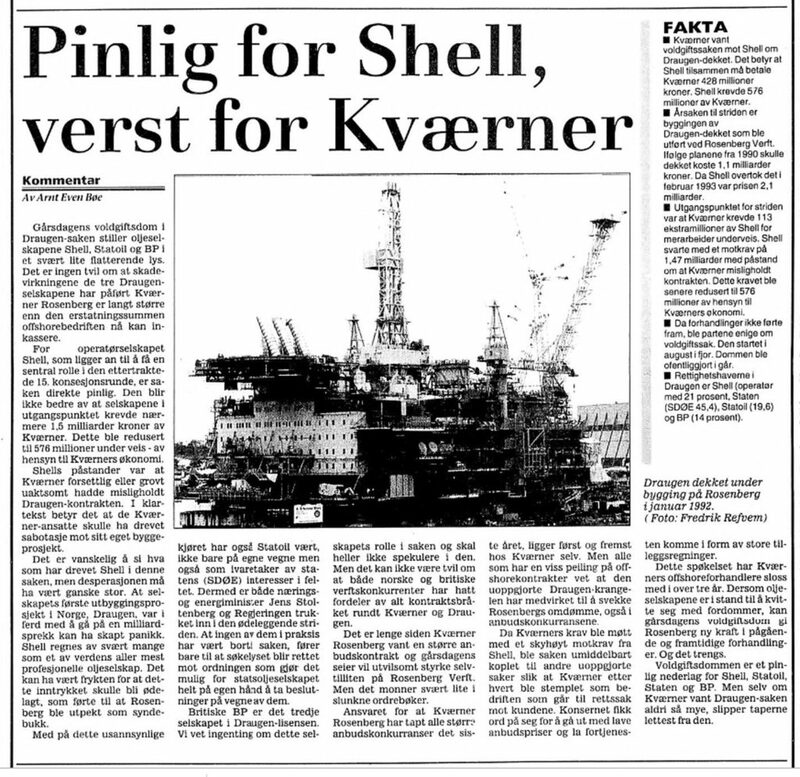 Planning accordingly started in 1989 at Shell’s offices in Risavika outside Stavanger, with a constant eye to moving the organisation north in due course. 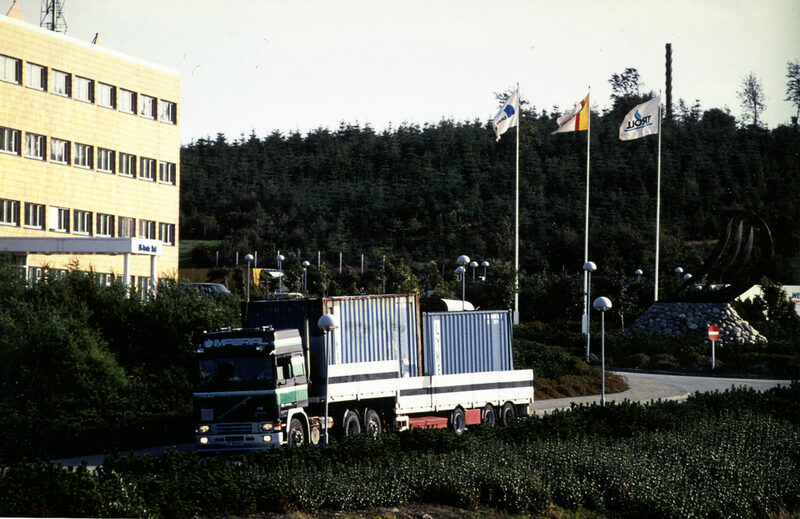 That occurred during the summer of 1992, when staff and their equipment were moved to Kristiansund. The operations team was fully in place at the new Råket office on Monday 10 August. [REMOVE]Fotnote: Stavanger Aftenblad, 8 August 1992, “Mandag bor de i Kristiansund. 200 ansatte i Shell flytter nordover denne helgen”. The challenge in building up the team was to strike a balance between local and expatriate personnel as well as contract staff. While one aim was to recruit as many people as possible from mid-Norway, additional competence had to brought in. As part of the global Royal Dutch/Shell group, Norske Shell could draw on expertise and experience from the international organisation. A number of expatriates were assigned to Norway and Draugen, and their know-how was important in the start-up phase. Over time, however, they were replaced with locals. 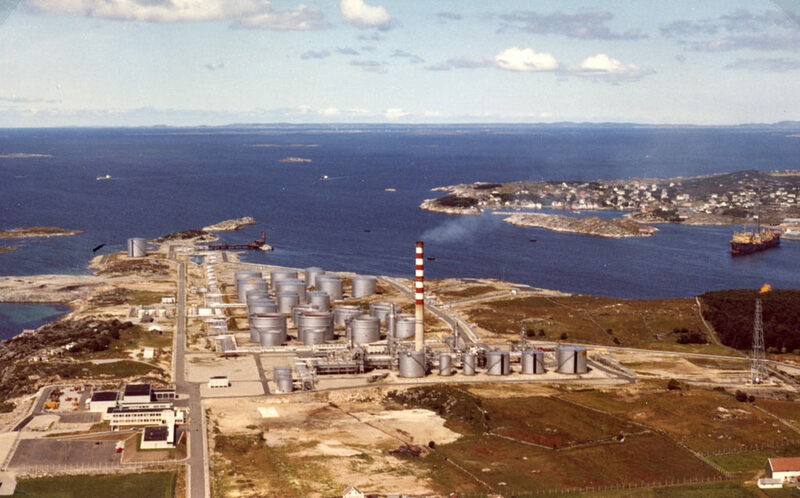 Norske Shell also had an operations organisation for its refinery at Risavika, and personnel from there were recruited to staff the Draugen outfit. The operations group for an offshore platform is split between office and support functions on land and the workforce on the facility itself. In the Draugen case, an early decision was taken to locate as much of the work as possible onshore. Offshore staffing would be kept to a minimum. Plans called for the platform to be run directly by 43 people per shift. With three shifts, that added up to a total of 129 personnel in the organisation. 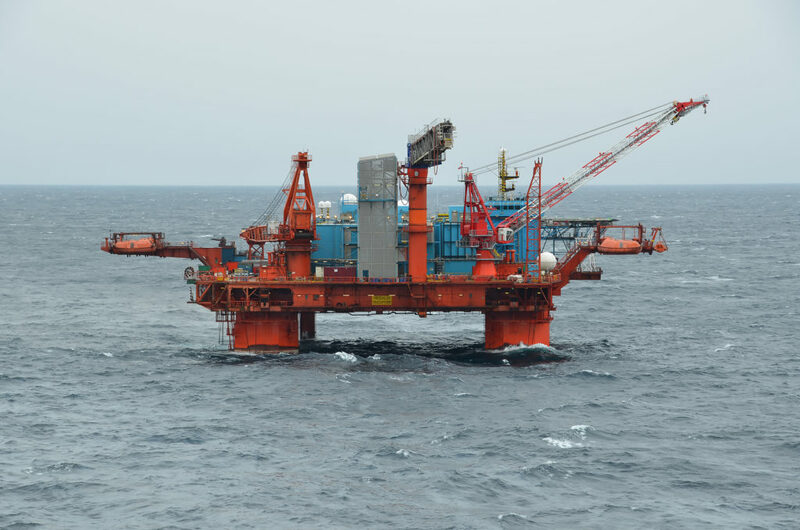 Due to handle normal operation and limited maintenance assignments, this staffing represented a big reduction from similar facilities on the Norwegian continental shelf (NCS). Since Norske Shell was not the operator for any other producing fields off Norway, it was easier to take new approaches to Draugen’s organisation. Such a small staffing would require contractors to be hired for all work outside normal production – catering, drilling, planned maintenance and modifications. [REMOVE]Fotnote: Telephone conversation between Gunleiv Hadland, Norwegian Petroleum Museum, and Gunnar Ervik, 26 April 2017. Operations head Terje Olsen presented the philosophy for operating Draugen in a speech to the Halten Bank conference in March 1992. [REMOVE]Fotnote: Terje Olsen, operations head A/S Norske Shell E&P (1992), “Drift av Draugen og bruk av lokale og regionale leverandører”, Halten Bank conference. Safety and environmental concerns occupied centre stage, he said. Part of the safety philosophy was precisely to station the smallest number of people offshore. Work there would be reduced by extensive use of automation, conscious choice of materials, good accessibility and a concentration on condition monitoring. 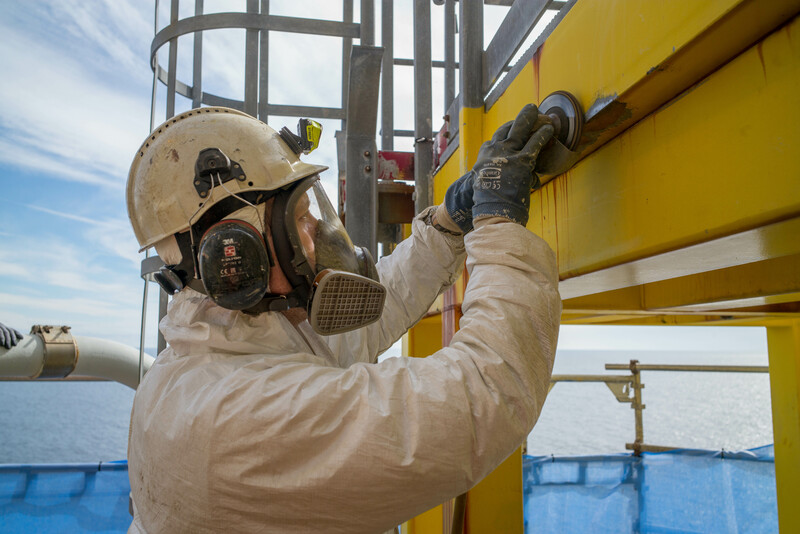 The normal procedure on other installations was to disassemble equipment and send it ashore to check for wear and tear, but Norske Shell took a different approach. 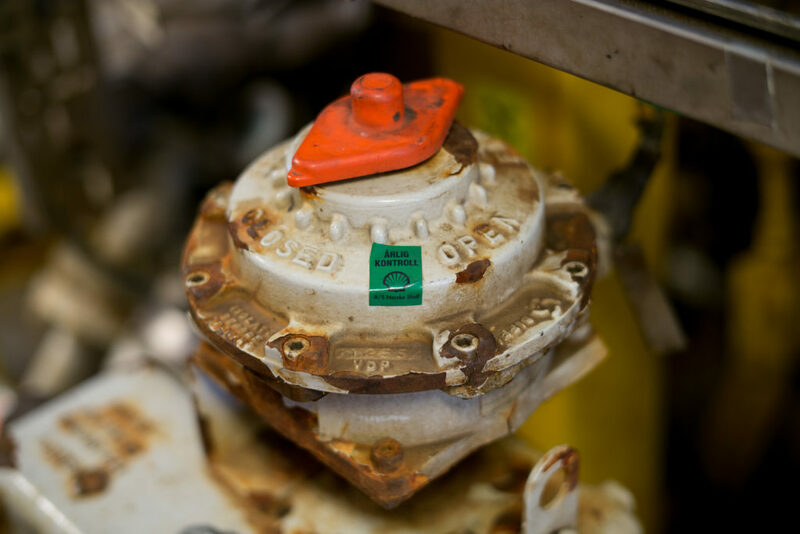 Vibration meters would be installed and equipment inspected regularly, with the findings sent ashore for analysis by specialists. These would then set maintenance priorities in consultation with the offshore workforce. [REMOVE]Fotnote: Ajour (house journal for Norske Shell’s E&P department), no 2, 2 May 1991, “Vedlikehold med lav bemanning. Sikkerheten er ivaretatt”. Only unavoidable repairs were to be done on the platform. Equipment not significant for safety would be sent ashore. Rather than strip down a pump and maintain it in the platform workshop, the plan was to replace the whole unit with a new one. Maintenance or repairs would be done as far as possible at sub-contractors, preferably in mid-Norway. Shell had nobody for such work and therefore planned for back-up equipment offshore. [REMOVE]Fotnote: Ajour (house journal for Norske Shell’s E&P department), no 2, 2 May 1991, “Vedlikehold med lav bemanning. Sikkerheten er ivaretatt”. An important precondition for reducing the platform workforce was the development of information technology and high-speed data communication. 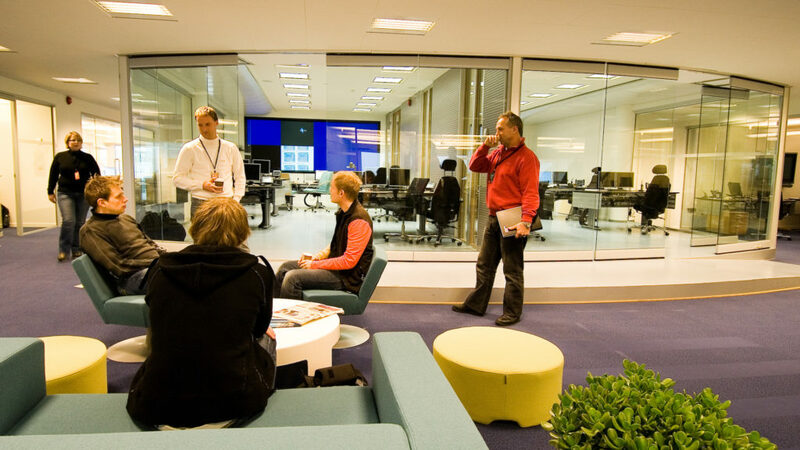 In that context, the Råket office was the first building in Kristiansund to be connected to the Norwegian telecommunications network by fibreoptic cable. It was tied during July 1992 into Shell’s international computer network, and Draugen was also linked in via satellite in the following summer. [REMOVE]Fotnote: EPO Express, June 1992, “Avansert datakommunikasjon: ‘Hjertet i nybygget’”. With satellite transmission capacity limited, data communication between sea and shore was perceived as unstable and time-consuming. A computerised system for maintenance management was purchased in 1991, but response times experienced out on the platform were initially long and unreliable. [REMOVE]Fotnote: EPO info, no 2, 1994, “MMS-system for vedlikeholdsstyring”: 12. Such transmissions have been based since mid-May 1995 on a radio link, which provides much greater capacity for both data and phone communication. The satellite equipment was demobilised in the autumn of 1995. [REMOVE]Fotnote: EPO info, no, 3 1995, “Radiolink på Draugen”: 14. The maintenance management solution formed part of the computer systems intended to support operations. Digitalisation had made great strides at that time. 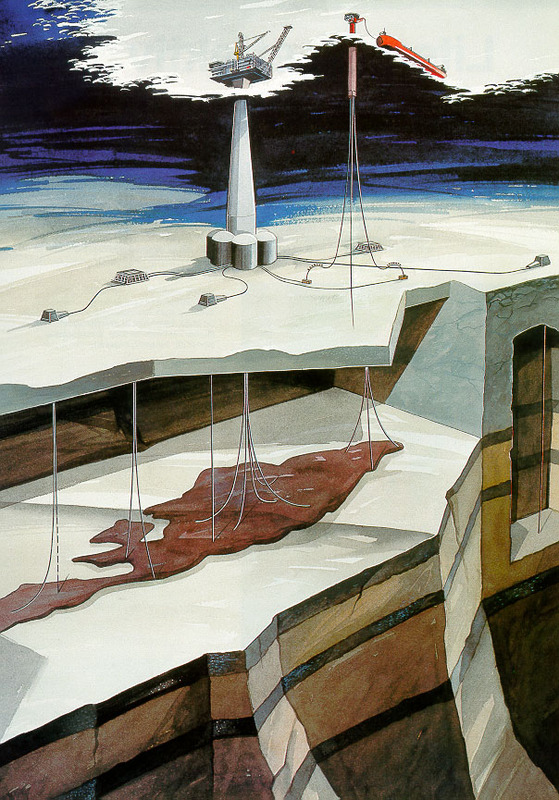 Virtually all technical drawings and seismic maps were available in digital form, and could be updated on the computer in the event of changes. [REMOVE]Fotnote: Ajour, no 2, May 1991 “110 mill. kr. i IT-satsing”: 9. If somebody falls ill, we have nothing in reserve and are then dependent on a colleague from a different shift turning up to work. Pressure on the individual to put in an extra effort has increased, and it’s important that this is planned as well and as early as possible.”[REMOVE]Fotnote: EPO info, no 3, 1995 “Draugen-plattformen: Bedret kommunikasjon”: 8. The workforce on Draugen in 1993-95 far exceeded the planned minimum staffing, as a result of projects pursued after production had begun. Construction work and drilling came to an end during 1995, and the number of personnel on board began to decline towards the goal of 43 people. [REMOVE]Fotnote: EPO info, no 2, 1995, “Vedlikeholdskampanjer gir økt kostnadseffektivitet”: 7. Several production wells were completed during this early period. Capacity for producing oil was upgraded in 1995 and part of the process plant was replaced to optimise output. The bulk of this work occurred during a 10-day June shutdown. [REMOVE]Fotnote: EPO info, no 4, 1995, “Oppgraderingen på Draugen: Suksess i første fase”. Drilling on the field was completed in February 1996 with the fifth production well. Norske Shell’s drilling department had been stationed in Kristiansund since 1992 as an integrated part of the Draugen organisation. [REMOVE]Fotnote: Ajour, no 2, May 1991, “Boreavdelingen til Kristiansund. Vi gleder oss til 1992”. 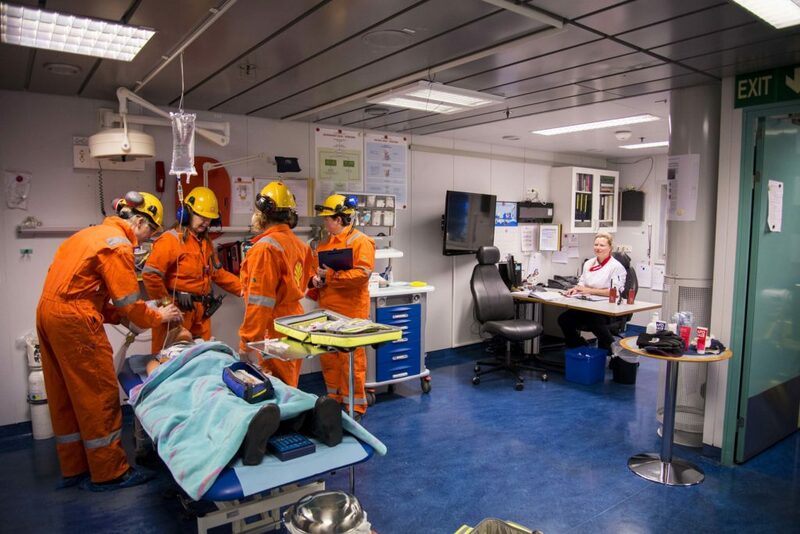 Following the final well, its seven staff were transferred to Stavanger to cooperate with the exploration team there. They were mostly expatriates, used to moving at short notice. [REMOVE]Fotnote: Tidens Krav, 7 February 1996, “Shells boreprogram avsluttet på Draugen”. Opportunities for improving the running of Draugen in a number of areas were outlined in a report entitled Operations 2000, which was produced by a group established during 1996. This found that costs could be cut while simultaneously increasing output, and figures were put on what was to be achieved by 2000. Most targets had already been reached at the end of 1997. The production increase was bigger than planned, and operating costs declined steadily. High oil prices helped to ensure Norske Shell’s best-ever profits. [REMOVE]Fotnote: Verdiskapning innen Draugen driftsorganisasjon (1998), project assignment, Management programme, BI Norwegian Business School. But oil prices are seldom stable. They sank again as early as the following year to USD 10 per barrel, and operating results therefore deteriorated. That presented Norske Shell Exploration & Production (NSEP) – the new organisation put in place from 1 June 1999 – with fresh challenges. [REMOVE]Fotnote: Shell UP, July 1999. NSEP 2000 og ny strategisk retning. External factors such as oil prices had a direct impact on operating profits and contributed, along with cost overruns, to results the company found unacceptable. [REMOVE]Fotnote: Consultation group, NSEP 2000 (May 1999): Sammen om felles fremtid, Shell UP. A new reorganisation was initiated, with a project on “Draugen – shaping up for the future” leading the way. Carried out in 2002-04, this involved restructuring the team running the field. The goal was to reduce operating costs, primarily by transferring a number of jobs and personnel to land. The first function moved was the telephone switchboard. Thereafter, staff at Råket had the job of booking helicopter flights for personnel heading to or from Draugen. The radio operator job on the platform was transferred to the nurse. This change process was eventually coordinated with a major restructuring of Shell E&P’s European organisation, which brought all exploration and production units into a common organisation. In this connection, the “x-border asset” body was established in Shell E&P Europe to help coordinate the sharing of experience and implementing strategy across the Norwegian-UK border. X-border asset consisted in 2006 of the Draugen and Goldeneye operations organisations, on the NCS and the UK continental shelf respectively. In addition came the Mossmorran and St Fergus gas terminals in Scotland. Britain’s Brent field belonged for a while but was later separated off. [REMOVE]Fotnote: Shell Drift Draugen og Ormen Lange, no 6, 2006, “No borders in x-border”: 4-5. Ormen Lange on the NCS was included in 2007. 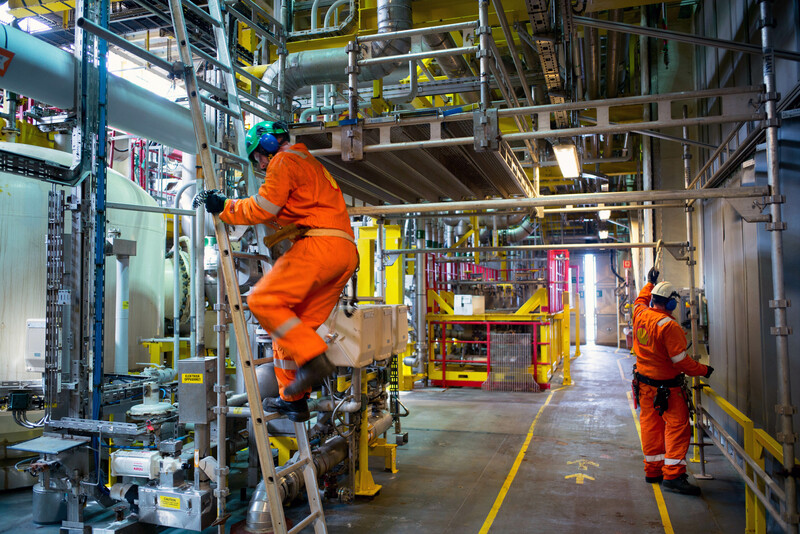 A goal of the Draugen organisation in this period was to become a centre of expertise within Shell for production, maintenance and communication. Team members were given new reporting paths to Shell’s offices in both The Hague and Aberdeen. A number of employees acquired greater responsibility through such cross-border reporting. That made the job more international for many, with wider opportunities for working in other countries for periods. But the restructuring also meant that reporting lines became longer, and time lags between meetings with those one reported to could become lengthy. [REMOVE]Fotnote: Interview between Gunleiv Hadland, Norwegian Petroleum Museum, and Alf Kristian Lillebo, 14 May 2018. Gas was discovered in 1997 about 120 kilometres north-west of Kristiansund, with Norsk Hydro as operator and Shell as one of the licensees. [REMOVE]Fotnote: Stavanger Aftenblad, 10 April 1999, “Alle mot alle på Ormen Lange”. This discovery was named Ormen Lange. 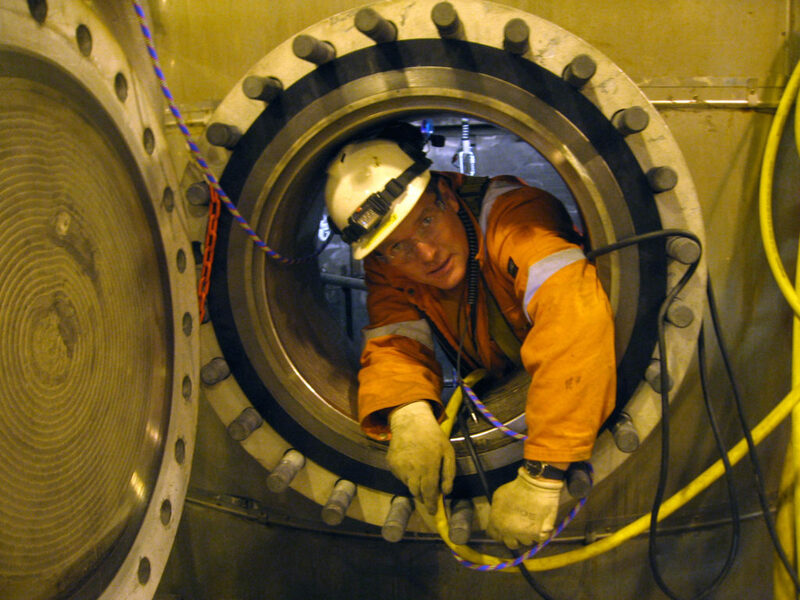 While Hydro became development operator, it was established in 1999 that Norske Shell would take over after the field came on stream in September 2007. That happened the following 1 December. Shell also secured responsibility for preparing the subsea and onshore installations for production, and for coordinating work on drilling the production wells. [REMOVE]Fotnote: Proposition no 41 (2003-2004) to the Storting: Utbygging og drift av Ormen Lange og anlegg og drift av Langeled m.v: 7. It was decided to develop Ormen Lange with remotely controlled subsea installations tied back to a land-based processing plant at Nyhamna outside Molde, south of Kristiansund. Gas and condensate output was to be transported ashore as an unprocessed multiphase flow through two 120-kilometre pipelines in water depths down to 1 100 metres. That called for technological advances and the adaptation of equipment, as well as for new forms of operation, and this became an important project for developing remotely operated production. The operations team responsible for the land-based plant was stationed at Nyhamna, with management and technical support for this facility provided from Råket. [REMOVE]Fotnote: Pettersen and Sæter (2014): RFID-merking av sikkerhetsventiler: Forbedring av informasjonsflyt i vedlikeholdsprosesser på Nyhamna, thesis for a BSc in petroleum logistics, Molde. 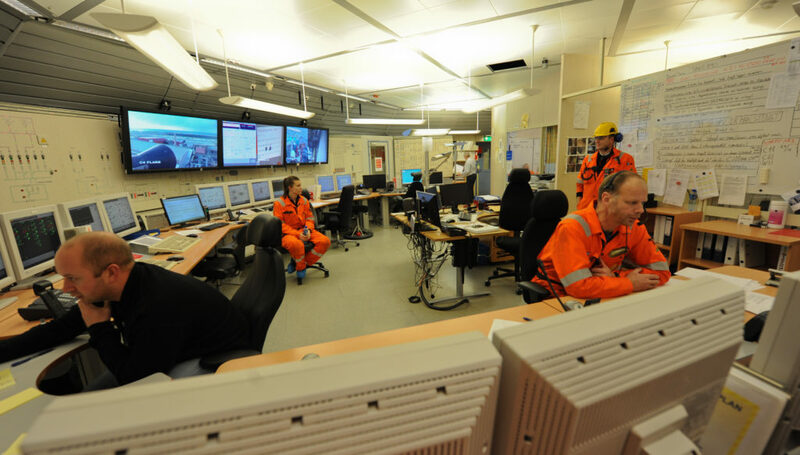 As with Draugen, training was organised for operators ahead of production start-up using a simulator which imitated control room functions for Ormen Lange. This was installed alongside the control room in the administration building at Nyhamna. [REMOVE]Fotnote: Shell Drift Draugen og Ormen Lange, no 1, 2007, “Simulatortrening gir trygghet”: 11. 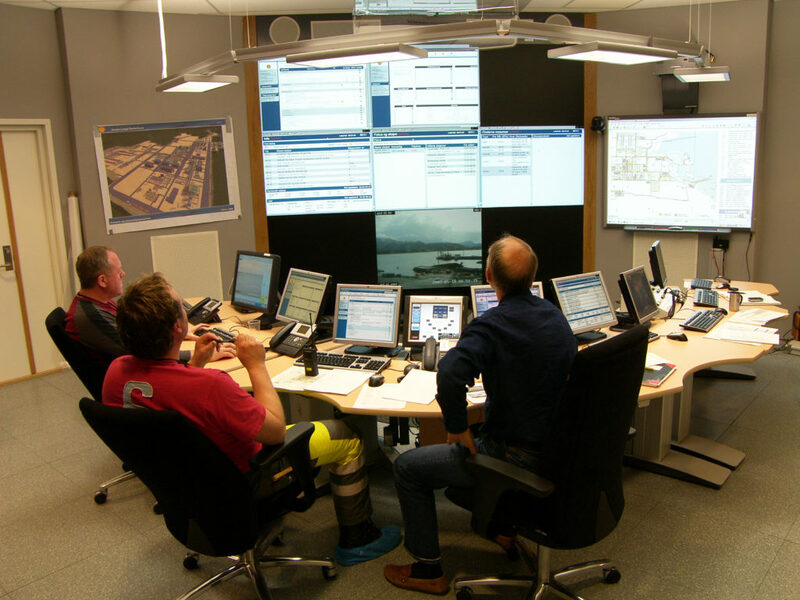 The Råket operations centre opened on 31 January 2007 with provision for integrated or e-operation, which permits follow-up and possible control from land. [REMOVE]Fotnote: Shell Drift Draugen og Ormen Lange, no 1, 2007, “Råket Operasjonssenter åpnet dørene”: 14. Supporting both Draugen and Ormen Lange, this facility ranked at the time as the most modern of its kind in the Shell group and was tied into Shell Europe’s communication network. [REMOVE]Fotnote: Aarset, M and Moe, O (2008), “IT Security and Architecture for Integrated Operations: Examples from deliveries to Ormen Lange and Draugen”. Intelligent Energy Conference and Exhibition, Amsterdam, The Netherlands. Experts in relevant disciplines could now monitor and comment on work offshore from the centre, reducing the need for them to visit Draugen. Although it now became possible in principle to run the platform entirely from land, this opportunity had yet to be taken by 2018. [REMOVE]Fotnote: Telephone conversation between Gunleiv Hadland, Norwegian Petroleum Museum, and Gunnar Ervik, 26 April 2017. The operations support team on land included experienced production operators from the platform, and the coordinator on land rotated with the same job offshore. While land personnel could follow up shifts on the field to a greater extent than before, high-quality videoconferencing was also provided. That in turn permitted closer monitoring and regular long-range meetings between sea and shore. [REMOVE]Fotnote: Bjerkestrand, Tor (13 November 2007), “Integrated Operations”, presentasjon, Draugen MCM. Transferring work ashore is not unique for Draugen or Shell. Once fibreoptic cables are in place for fast data transmission and collaboration, this has occurred on most Norwegian platforms. [REMOVE]Fotnote: Paulsen, Gard (2005). Informasjon over Nordsjøen: Telekommunikasjoner på norsk sokkel, research report no 3, BI Norwegian Business School. However, no fibreoptic cable has been laid all the way to Draugen. Communication with the field continues to utilises a radio link. Actual staffing on the platform varies in line with the work under way – conversions or more substantial maintenance, for example. A common feature is that the permanent operations organisation offshore does as little as possible. Major maintenance and conversion campaigns are handled as specific projects, where extra personnel are hired in when required. The Draugen operations team was the first in Kristiansund, just as the field was the first on the NCS to be operated by Shell. Much of the organisation therefore had to be built up from scratch. More such bodies were eventually established in the area, and Shell also became production operator for Ormen Lange – which benefitted from the experience gained with Draugen. From the start, a key aim in operating Draugen was to minimise the platform workforce and do as much as possible on land. A number of reorganisations have sought to optimise this. In connection with Ormen Lange, further concepts for operation from land were developed with the Kristiansund centre tied back to Draugen and Ormen Lange by fast data links. This development forms part of a pattern in the oil industry, involving increased use of data communication, remote control, integrated operations and collaboration between sea and shore.